We have been mentioning a lot about video optimization recently. We even went to great lengths to compile a list of various video aggregator sites. Near the top of that list you will see Yahoo Video. Earlier today, Yahoo announced some great new changes to their Yahoo Video platform. Wider Viewing Experience - Yahoo! Video supports a 16:9 cinematastic player that’s far ahead of what most sites are offering. 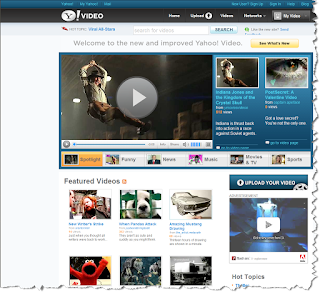 Added Content -Yahoo is including video found throughout Yahoo!, including music, movies, TV, news, sports, and a whole lot more. Of course they are still committed to featuring the best videos from all of the independent video creators that submit videos to Yahoo. Upload Larger Files - This is pretty cool, Yahoo has raised the max file size to 150 megabytes, so you can upload longer, higher quality video. More Video Sharing Options - With Yahoo Video, not only can you embed individual videos on your blog or site, you can create your own video experience with embeddable playlists. These are but a few of the new updates to Yahoo Video. You can view the entire list of video changes over at the Yahoo Video Blog. With a number of great categories ranging from entertainment, food, How-To, Music, news and politics, sports, travel and more there is something for everybody on Yahoo Video.